Joner Law PLLC, Attorneys at Law, Battle Ground, Washington – The Parent Trap, Part 2: What about the car keys? In the United States, we have laws that require people to be “old enough” to drive a vehicle. But what about being too old? 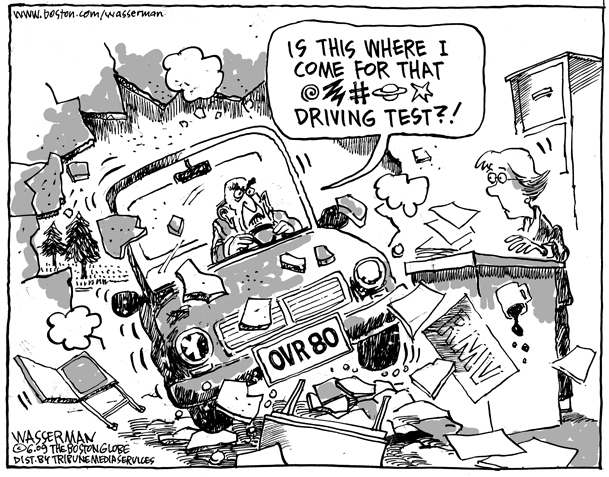 This is an issue that is becoming more prevalent and begs the question: can a person become too old to drive safely? This is a question without a simple answer. Most often, the answer is based upon the specific facts of each individual situation. However, if you have an aging parent with whom driving is becoming a concern, there are steps you can take to ease tensions and ultimately work to keep them and others safe on the road. The first step is to identify the issue on a broad scale. It will be beneficial for you and your parent to look at the problem as a matter of functionality, not as old age. Simply telling your loved ones that they are not safe drivers anymore because they are “too old” will likely make it more difficult for them to admit there might be a problem and accept the changes that potentially need to be made. Most elderly folks view losing their license as a loss of freedom and independence. Labeling them as “old” may increase this frustration. As a result, it is better to take an objective standpoint. After all, it is not how old people are that really affects their driving skills – it is how well their bodies and minds are functioning. Consequently, viewing the issue as one of functionality reminds us that everyone is different. The age at which each person begins to have problems on the road will vary depending on each person’s circumstances. So how do you know if safe driving might be an issue for your loved one? It is important to watch for the signs. They are not hard to see if you’re keeping an eye out. Warnings may include close calls when your parent is on the road. Fender benders, tickets, and near accidents all fall under this category. Another red flag might be receiving calls from your parent about getting lost en route. Remember, taking away a person’s driving rights can be a hard thing for them to come to grips with. It is important to consider how you approach them when you decide it’s time to deal with the problem. The best thing you can do is to talk to them about planning ahead. In other words, address the problem before it becomes critical. This allows your parent to maintain control of their own concerns. If you can help them stay aware of their driving condition and encourage them to take care of the little problems as they come up, it enables them to stay on the roads safely for a longer period of time, which in turn, protects their independence. Don’t forget – they are not “too old” to drive. They are simply experiencing issues with functioning safely on the road. In many cases, these problems can be solved by attending to them as they arise. Encourage your parent to get more frequent eye exams to ensure that their glasses are up to date and are keeping their vision sharp. Likewise, have them check their hearing often and keep any hearing aids they may need in good condition. If they are experiencing pain or stiffness in their joints that may impair them in turning a steering wheel or hitting a brake pedal, help them take steps to fix these problem areas. Another important area to discuss is altering their driving habits. If they are becoming uncomfortable in certain driving conditions such as darkness or busy traffic, encourage them to avoid these conditions. Changing their driving habits may be a small sacrifice to make if it means keeping the freedom to travel on their own. Unfortunately, your loved one may reach a point when it is no longer safe for them to operate a vehicle under any conditions. If this is the case, approach them with respect and support. Letting go of the keys may be incredibly difficult for them. Make sure you let them know that you are there to help them through the transition. Putting safety first is not a sign of weakness, it’s a sign of courage. When you do decide to talk to them, present them with the facts of the situation. Explain the specific problems that are impairing their driving. Using real examples of their warning signs can be helpful for them to come to grips with the facts. Once you’ve explained to them that you are concerned for their safety, present them with tangible options for the future. Feeling like they still have options for transportation may lessen the feeling of helplessness and ease the transition. Alternatives may include taxis, public transportation, private drivers, or local elderly transit. They might have the option of carpooling with other elderly friends that are still fit to drive. Maybe a younger relative could volunteer to assist in day to day travel. Whatever the solution may be, be sure that you have positive alternatives ready for them. While removing or limiting driving privileges is not always an easy issue to address, safety is the most important concern. Ensuring the safety of your elderly loved one and of others is worth the effort. If you have a parent or relative who may be facing the possibility of losing their driving ability in the near future, start planning now. Work with them to prepare for the future and make the wise choice. Coming October 18, The Parent Trap, Part 3: Guess Who’s Coming to Dinner (and Breakfast)? and near Battle Ground HS.